Dhikala is most popular & loved tourist accommodation Jim Corbett National park area, Dhikala is a Paradise Awaiting The Dhikala Complex is most sought after place to stay at, Herds of Chitals Elephants are seen from the complex itself, Which attracts park visitors enormously. Dhikala stay is once in lifetime experience , Dhikala is accessible via Ramnagar , Dhangari gate is main entrance for Dhikala Forest Lodge, Dhangari gate is located 19 kms away from Ramnagar and Dhikala Tourist Complex is 32 Kms away from Dhangari Gate. Dhikala is open for tourists from 15th November to 15th June. Dhikala is inaccessible in Monsoon period. 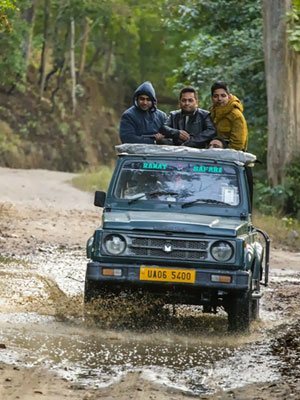 As we all know Dhikala is most popular part of Jim Corbett National Park , Dhikala Forest is known as core area of Jim Corbett National Park, Dhikala is located right in middle of Corbett National Park, Dhikala forest lodge overlooks Ramganga Reservoir . Dhikala Forest Lodge is situated 43 Kms away from Ram Nagar town. Jhirna tourist zone in corbett national park is situated at 16 km. from Ramnagar. 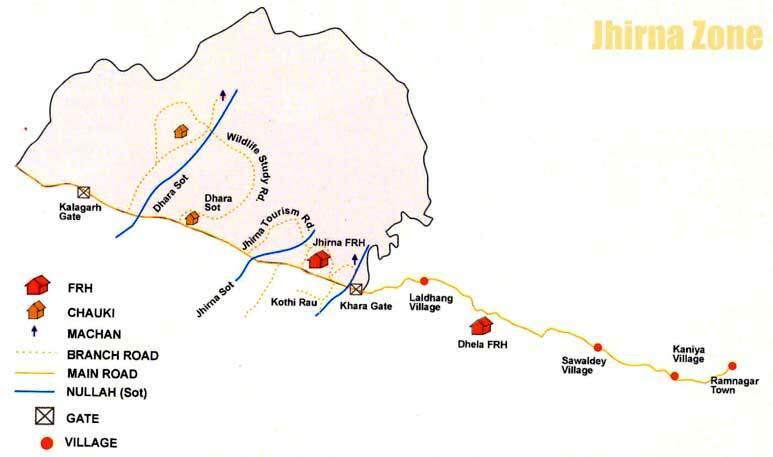 You have to obtain the permit issued by the Corbett Tiger Reserve before you proceed to Jhirna. This area is full of natural beauty and specially known for its wild beer which suddenly appears from nowhere near your vehicle. 25 vehicles are allowed to get into this area in the morning and same number is allowed in the evening. For morning trips, day visit permit is released in advance which comes into effect for six days before the actual day of the trip. For evening trips, first come first serve system is followed. 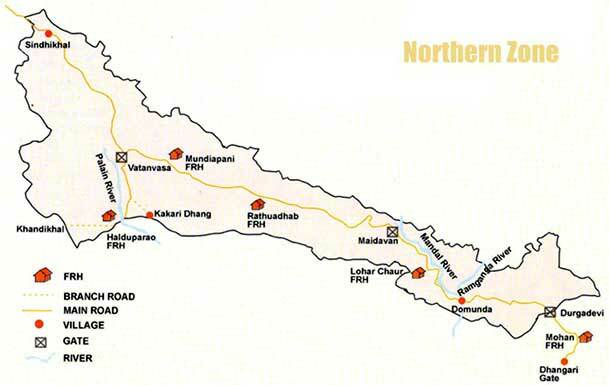 This is the only tourist zone in Corebett National Park which is open for all 12 months. It's compulsory to take a guide along. Jhirna has a forest lodge which has two rooms. You can stay the night here and go for an elephant safari in the morning. Durgadevi tourist zone in corbett national park is farthest from Ramnagar at 28 km. 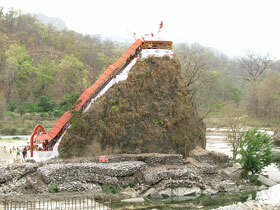 This zone is a hilly area and is situated along the banks of Ramganga River. Besides looking at wildlife, you can also look at popular Mahasheer fish in the river waters. On your way you can halt at Dhangarhi museum. For the day visit, same rules are applicable here as those for Bijrani and Jhirna. 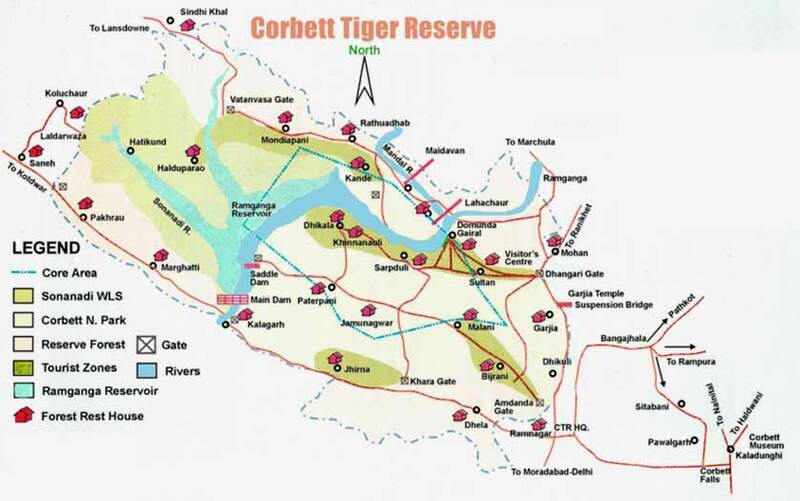 Sitabani tourist zone is not under corbett tiger reserve. In Sitabani, there is no limitation of vehicle. It's a famous zone for bird watching. This is the only forest in corbett where we can walk inside the forest. Sitabani known for a temple and river. We can take some rest in river bank and see the reptiles. Morning and evening is the timing of safaris. When all the zones of CTR are full then we choose this zone for safaris. Corbett national park authority not issue permit for this. Sitabani forest department issue the slip for this safari. Scenic view of this part of the forest calls many tourists again and again. 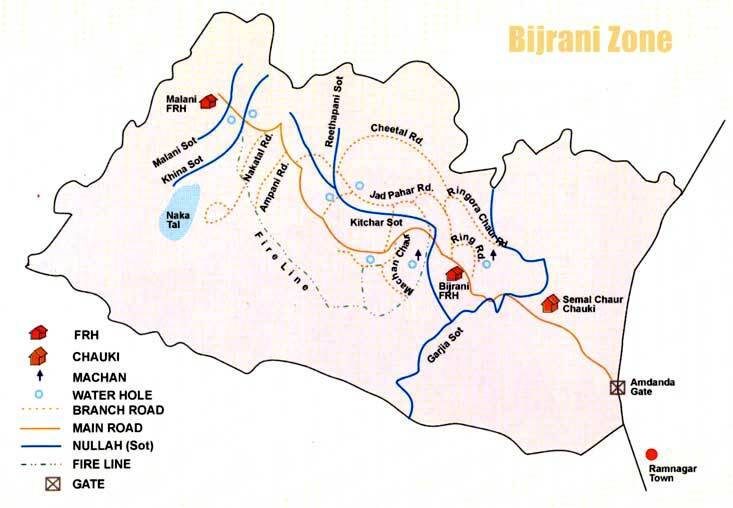 Bijrani tourist zone in corbett national park is the first choice among day tourists. Its entrance is at Aamdanda which is about 1 km. away from Ramnagar. After entering through Aamdanda gate, you cross about 5 km. of buffer zone before reaching Bijrani and jungle safari starts from this point. Bijrani is a beautiful spot and is known for its vast grass lands, deep forest , stormy drains and wild life. 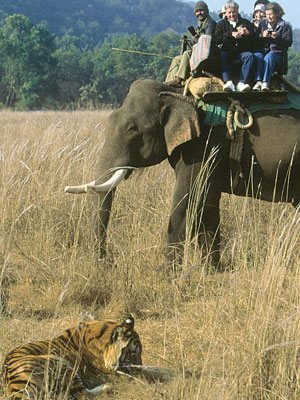 To visit this area, permission is granted by the Director, Corbett Tiger Reserve. Maximum 30 vehicles are allowed to travel into Bijrani during morning and same number of vehicles is allowed in the evening hours. 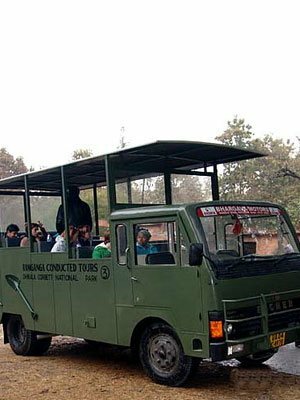 For morning safari advance booking is required and for evening safari, permits are given on first come first serve basis. Bijrani has a forest lodge which has six rooms and a dormitory consisting of four beds. You can also take an elephant safari here. 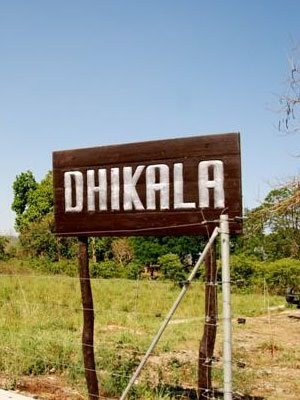 Dhikala is the biggest forest zone in the corbett national park and you enter this zone via Dhangarhi gate. You have to show your permit at the entrance gate and once it is checked then only you are authorise to enter the park. Once you are through the Dhangarhi gate, your corbett safari is on. Only those who have permit to stay overnight in the park are allowed to take the safari. You can stay for night in the park from one to three nights. It takes about one to one and half hour to reach forest lodge inside the park. On the way you will encounter dense Sal forests, look at Ramganga river and will across many monsoon-drenched drains. Touring by gypsy is not permitted in Dhikala during day time. However you can travel into this area by a Canter which takes in 18 passengers and starts off from Ramnagar in the morning and return to base in the afternoon. This tour is called as Ramganga conducted tour and is permitted by the Corbett Tiger Reserve .